Service Location/City all over India. Application Method Self Levelling PU Application by Industrial Trowel,Spike Roller,Heavy Duty mixer. Provide Service In Pharma,Food ,Beverage & Heavy Duty Engineering etc. Brand Dr.Beck,CIPY,APURVA,MYK / other Equivalents. Usage/Application Ware house,Cold Storage,Pharma,Food,Beverage etc. PU flooring Services are Widely Used in Food,Engineering, Pharma,Beverage,Heavy Duty Industries all Over India. PU flooring Provides Homogenous ,Jointless Monolithic Matt finish Industrial Floor. It is Antislip & Antiskid in Properties. 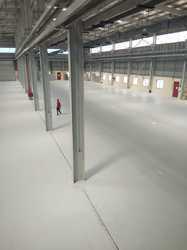 For Cold Storage flooring Solution - PU flooring Services are Highly recommended Worldwide. As Compare to Other Flooring Services, PU flooring Services are Much better in Performance as well as Long lasting. We offer PU flooring services all Over India of various Renowned Brands Available. Looking for PU Flooring Services ?